The word brit means covenant. Brit milah is the covenant of circumcision between G-d, and the Jewish people. Approximately 4,000 years ago, G-d, commanded Avram to circumcise himself as an everlasting symbol between G-d and Bnei Yisrael, the Children of Israel. G-d declares, "... the mountains may depart, and the hills may be removed from you; but my kindness will not depart from you, nor shall my covenant of peace be removed (Isaiah 54:10)." The brit is the spiritual entrance of the Jewish people into our covenant with G-d. It is the only mitzvah conferred upon the Jewish people before they became a nation. "The holy covenant is the foundation of true enlightenment, which is called the glory of the face, hadrat panim. The mind is refined by the wisdom of the Torah which one learns to interpret with grace and beauty through the thirteen rules of interpretation. These rules are the glory of the face (Rabbi Nachman of Breslov)." The Midrash relates that King David was never without his talit or tefillin. When he bathed, however, David was obliged to remove these sacred objects, which deeply saddened him. Reflecting upon himself, King David perked up and cried, "I rejoice over Your precept as on who finds a vast treasure (Psalm 119:162)." David realized that he always carried a holy treasure with him - his brit milah. According to halacha (Jewish law), the mitzvah of brit milah is first and foremost incumbent upon the father. 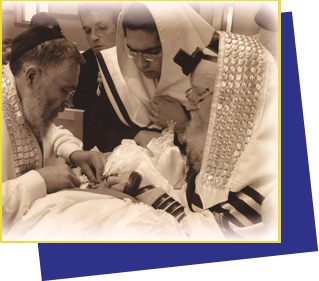 If, for whatever reason, the father fails or refuses to fulfill this mitzva, the beit din (rabbinical court) is obligated to perform the circumcision on behalf of the child. However if the child has entered adulthood—13 years of age or older—he himself is obligated to fulfill the commandment of brit milah. The importance of the brit is signified in our daily prayers and in the prayer for naming the newborn infant where we recite "Remember forever His covenant, the word that He commanded for a thousand generations (Chronicles 1:16:15)." This imposes an obligation upon the seed of Avraham, Yitzchak and Yaakov to remember forever that they are bonded to G-d.
"One who guards the covenant in purity will come to perceive the source of all blessings which flow into the world, spiritual and material. This root is pure radiant light. When one attains this perception, all desire for materialism simply disappears (Rabbi Nachman Breslov)." A circumcised infant is provided with this foundation. "Torah is great. If not for Torah, G-d would not continue the world's existence (Talmud, Nedarim 32a)." If not for Milah, G-d would not have created the world! A person who lacks an inner commitment to the covenant is described as "uncircumcised" (Jeremiah 9:25 & 6:10; Ezekiel 44:7; Deut. 70:16; Exodus 6:12). If an individual's heart is blocked he is unable to be mindful of G-d's commandments. The brit removes both the external and the inner layer of the skin. So too are we asked by G-d to refine the external and innermost aspects of ourselves. G-d said to Avraham, "Walk before Me and be perfect (Genesis 17:1)." Our sages raise the following question: In his greatness, why did Avraham fail to keep the mitzvah of brit milah? Because a covenant is a pact between two entities. While Avram knew what G-d wanted of him, he waited for God to ask, to command him. Once circumcised, Avraham became tamim, or perfect. "I will establish My covenant between Me and you, and I will make you exceedingly numerous... This is My covenant... you shall be the father of a multitude of nations. And you shall no longer be called Avram. But your name shall be Avraham... I will make you exceedingly fertile and make many nations of you (Genesis)." Brit milah is the permanent sign of the Jew's greatness. It testifies to his being selected by the Creator, to be Hashem's chosen nation, to serve Him and relate His praise. The mitzvah to circumcise ones son is greater than other positive commandments in many unique ways. The word brit signifies 1) an eternal bond of friendship, 2) an agreement, 3) a guarantee, and 4) an attachment to Hashem. It is used 13 times in the Torah portions that discuss this mitzvah, in addition to the 3 times the Torah says brit for all mitzvos in general. This testifies to how great themitzvah of milah is. In addition, failure to comply with this mitzvah is punishable with korais (excision). Even Moshe Rabainu, who was traveling for a most sacred mission, was taken to task and would have been punished, for delaying circumcising his son. Milah saves a person from the retribution of Gehinom. For Avraham Avinu waits at the entrance and refuses entry to all those that are circumcised and have maintained the holiness of the covenant of the brit. The Torah clearly states that Jewish boys should be circumcised on the 8th day of life. Hashem created the world in seven days. Shabbat, the seventh day, represents the unity of Hashem with his creation. In mystical Judaism, the eighth day of Hagim, festivals, and the bris contain a spiritual connection that is beyond nature. It is our metaphysical connection to Hashem. The bris milah is the first act in elevating the physical to serve G-d.
Scientists have determined that a baby's blood clotting system is at its peak on the 8th day of life. Clotting ability gradually improves from birth until the 8th day, when it is actually at "super-natural" levels. Following the 8th day, it gradually declines to normal levels. Hashem created the world in perfection. This perfection is all encompassing and it is bound up in the mitzvah of brit milah. The number eight is also the essence of Hannukah, the festival of light which commemorates miracles brought down into this physical world. Oil sufficient enough for one day lasted eight days. Hannukah is also a celebration of a small group of pious Jews victory over the Greeks, a nation whose ultimate goal was to extinguish spirituality. Other examples of significant eights include the eight special garments the Kohen Gadol, High Priest, wore in the Beit Hamikdash, and the eight strands of the four corners attached to the Tallis, prayer shawl. Or Hachaim suggests an additional reason why the bris is on the eighth day. It assures that the baby has lived through one Shabbat (Sabbath). Once the baby has experienced the elevation from the secular weekday to the holiness of Shabbat, he is ready for the elevation of his physical body, the bris. Having the bris on the eighth day is so important that it even overrides the Shabbat. Cutting is forbidden on Shabbat, yet if the eighth day falls on Shabbat, the bris is still performed. A notable exception to performing a brit on the eighth day is when a baby is ill. Often newborns are jaundiced and the bris is postponed until the baby is healthy. As soon as the baby becomes healthy enough for the bris, it is done as soon as possible because one should be quick to perform a mitzvah. However, once the eighth day has passed, the bris cannot be done on Shabbat. Only a bris taking place on the eighth day can override the Shabbat. The brit ceremony consists of three parts. The first is the actual circumcision, the milah. The second is when the child is given his name. The third is the festive meal, seudah, in which we celebrate the miztvah with family and friends. 1) The K'vaterah brings the baby in, handing him off to as many people as desired. 5) First Sandek. The brachot are recited, and the brit performed. 8) the naming of the baby (kriat hashem). 9) The Mohel recites "Mi Sheberach"
10) The father recites "Ribono Shel Olam"
11) The baby is returned to his mother. It is customary to set aside a chair for Eliyahu the Prophet who is referred to as Malach Habrit, angel of the brit, or messenger of the covenant. When this chair is used we announce "This chair is for Eliyahu Hanovi." After the child is placed on the Chair of Elijah, the father takes the baby and makes the mohel his proxy. If the father has the ability to do so, he should perform the circumcision himself. If not, he appoints a mohel. The father says the blessing ".. who has sanctified us with his commandments, and has commanded us to bring him into the covenant of Avraham, our Patriarch." Everyone in the audience declares, "Just as he has been brought into the covenant, so too he should enter Torah, marriage canopy, and good deeds." The child is then placed on the lap of the Sandek The Sandek is an honor usually given to the father, grandfather, a very close relative or friend. It is desirable to perform as the Sandek, to hold the baby on one's lap during the circumcision, because it is a fulfillment of the passage "All my bones shall say: Hashem, who is like you? (Tehillim 35:10)." This refers to using all one's limbs to serve the Creator. The Medrash says that King David said that he used his knees to hold babies for circumcision. It is considered like one who builds a mizbeach (altar) and offers incense for Hashem. The actual procedure is an auspicious time for prayer. The baby's cry is a pure cry that pierces the heavenly gate. It is therefore open for others' prayers. In addition, it is important to have a minyan, a minimum of ten men, at a brit in order to publicize the mitzvah. Further, the baby is considered as one who has been released from prison who must thank Hashem in public. We therefore recite the phrase "Hodu Lashem Ki Toy Ki L'olam Hasdo" or "Praise Hashem for He is good, His kindness is forever (Chochmas Odom 149:21)." The naming of the baby is composed of three prayers. The first is a benediction over wine. The second one is in praise of Hashem, "Who sanctified the beloved one from the womb and placed the mark of the decree in his flesh, and sealed his offspring with the sign of the holy covenant. . . ." In the last prayer the baby's name is declared, verses are recited and the congregation declares: "Just as he has entered the covenant, so may he enter into the Torah, the marriage canopy, and good deeds." The Medrash states that all those who partake of the meal at a Bris are to be saved from Gehinom (Tosafos, Psochim 1 14A). Those who refuse to participate are considered ostracized by Heaven unless they have valid reasons for abstaining. We do not, therefore, formally invite people to participate. Instead we merely announce that the Bris Meal will take place at such a time. When Abraham circumcised his son he did so joyously and served a festive meal afterwards. The brit is a joyous celebration of another Jewish child entering the covenant. Therefore we celebrate with a Seudas Mitzvah, a festive meal just as Avraham Avinu did.